Pesach – Passover – commemorates the Exodus of the Jews from Egypt led by Moses out of 400 years of slavery into Israel, the land that God had promised on oath to Abraham. The Promised Land was finally reached, His promise fulfilled. Faith – blessed are those of strong faith and those who feel their faith wavering. We here in South Africa have mostly totally lost faith in the president. We are going through a very difficult time and we forsee it for a long while yet. Last Friday, thousands upon thousands of us across the country took to the streets. Across races, religions, ages – peacefully, vibrantly, noisily, in unity. The one I attended was wonderful and it was so great to be part of this. There were no political affiliations represented – it was mostly a call for the president to resign and for our country to regain unity. I carried a home made banner (helped by my husband) showing the flag with ‘unity’ written across it and on the back I pasted red hearts. There is another major one tomorrow when people will march to the Union Buildings in Pretoria, for the president to resign. I did not want to let Pesach and Easter go by without acknowledging it. All good wishes to you all. Thank you for reading. I got home from the airport, buying the Sunday Times en route, planning to do some things after I had chilled at home for a bit. I wanted to check on Harry our cat, who is an old chap already but he is I think, due to exit this world. He’s not eating, drinking a little water every now and then. I dreamed of him some nights ago, clambering up to a great height, then falling. I was in the bath, open to the elements and watched him falling. He landed on the side of the bath, his paws got a bit wet and then he slunk away. I was watching him in the garden this afternoon, sitting still, shifting position to face another way, then again and then again – I thought of the Buddha facing east, west, north and south as he bore witness to the earth and as he received enlightenment. I hope that Harry delays dying until my husband is back. He seems at peace. Right now, he’s sitting in my study on the mat with the glass door open. I left home soon after to go to Lynda’s home. I spoke to Richard who said that he was with her when she died, which was around 9.00 this morning. She was at peace he said – she died peacefully – I asked if I could go to her room and say goodbye – but no, he said. There were many people. I had a few meaningful interchanges with family. Her elderly uncle, so dear – a cousin who I saw fairly often when I visited; another cousin who flew in last evening from abroad and saw her last evening. And while I stick to my own advice of always keeping death alive on one’s left shoulder, my experience of her death leaves a hole in my heart ..
Q: ... the evolution of mind now appears no longer as a process of the adaptation of species to their environment but as the adaptation of minds to increasingly complex forms that exist in the cosmic potentiality. The cosmic connection means that the human mind is a mystical mind? A: Jung addressed the mystical traditions in its many forms throughout history. We could say that this resides in the collective conscious and unconscious. The connections remain between mind, body and spirit. It is different eras and people that put different spins on them. This is like contemplating aging – it will look differently depending on where you stand personally and culturally. We address expansion out of narrow ideas into broader perspectives on the aging process. Perhaps this is also a way of addressing the evolutionary process. Jung addressed this with the process of individuation or becoming all we are meant to be. That is surely a lifelong task. Q: How do I stop myself from feeling the existential angst of being 29? Do I feel anxious because of a primal desire to have children or am I scared that my 20’s have been squandered? Or both? A: I think it may be both. What you feel is also part of being an aware person who values the inner world and is not taking life lightly. The primal desires also relate to one’s own creative self and how that will be manifest. It comes not only through children but through the effort into discovering through life what it is to be you and what you have to offer to the world. Q: Susan, what if I know little (nothing) about Jung? Will I still understand this book? A: The book is about knowing oneself and reflecting on life … easy to understand concepts .. we are speaking about openings to oneself. Q: My question is on the cultural side … are your results global? Did you consider the cultural differences between ethnic groups? For example, Japanese do not have problems with aging .. a healthy respect and honor (is) awarded to them because of their age. … also in African-American in the Deep South. They see aging as an honor and they grow old gracefully. So was your sample mixed? Or did you limit it to a certain group of people? A: … we write about how the elderly are often marginalised in western societies and the sadness of that compared to the attitude of reverence towards the aged of other communities and societies…. We write mostly from our own perspective and experience of aging. Q: I am shocked by what I have allowed to occur in my life. Always positive, illnesses, a couple serious, have taken me from feeling young to resigning to old age. I know it’s my mindset and I simply want my active life back. At 75, I’m giving into old age and my health has been keeping me in this dismal thought pattern. … Even my spiritual attitudes have failed me. I’m not that old yet! Do you have any suggestions? A: … Life is pretty harrowing much of the time and even harder when there are health issues. Life is a mixture of depth and darkness, height and light – and it is always a learning curve. Life is not easy for any of us. But what of that? We must have perseverance and above all confidence in ourselves. We must believe that we are gifted for something and that this must be attained. Mary Oliver: Let me keep my distance, always, from those who think they have the answers. Dr. Susan Schwartz (in Paradise Valley, Az.) and I (in Johannesburg, South Africa) went live last week on Wednesday 22nd Feb on reddit. It was a week long AMA – ask me anything – and then on Wednesday we responded to the questions as they came up. I’m going to put up a few questions and our responses to them for your interest. The excerpt below in blue was an introduction to our book “Aging & Becoming ~A Reflective Enquiry” – and it’s a little abbreviated as are the questions and answers, from necessity. This is not a ‘how to’ book. Nor is a book about what, why, when and where. We’ve used personal stories and shared a few friends’ views. We’ve brought in myths and tales from the distant past. They live on as good myths do, speaking to our contemporary lives by illustrating the timeless trials and tribulations resonant to every generation. We’ve brought light and dark, pain and pleasure, heights and depths, shadows and the ever present paradoxes into this book. We’ve given aging honor and respect. It is our politic. We covered a wide array of topics; life, death and all else in between. From A – Z we reflect on aging – and becoming. This is what we do every day of our lives – age and become. The writing has brought into sharper focus and our reflections have afforded a deeper way of looking at this crucial stage. Aging underscores the inevitability of death and the realization that the limit of time narrows. Aging is part of living and the more conscious we are of it, the more we can actualize our potential. Q: Have you paid much thought about archetypal rites of passage, and how the individual may encounter these, and how archetypal studies can influence the maturation process by virtue of being aware of the process with a deeper understanding? A: Yes, we speak about rites of passage as in gaining awareness of oneself along the way. We give suggestions. Becoming oneself is maturity and as Jung says, it takes a lifetime. So, keep on being aware of self and others on your own particular journey. Q: How does aging cause us to re-align our switch to authenticity? Does reflection on aging ground our perception of aging? A: Authenticity does not come with age. It comes from internal and external awareness and consciousness. It comes from working with dreams, relationships, developing one’s passions and becoming a conscientious person. It comes with daily attention and care to one’s soul and others. Q: Jung said that we spend the first half of our lives expanding & establishing ourselves in the world and the 2nd half contracting to focus on what’s most important. What happens if that pattern is interrupted … considerations and circumstances i.e. … aspects of mental illness or trauma … breakdowns, blocks/complexes? A: There is no real order but all are part of the whole. … The challenge is to stay awake and value where one is in life. Jung valued the stages … all the way through. Self-knowledge is gained in many ways-dreams, synchronicity, relations, inner and outer feelings. These show us how we are living and are manifestations of the archetype. Q: What has in your eyes been the best part of growing older? A: … a little more comfortable in my skin … time is limited in that there is no longer a forever as in the fairy tales – and more of a realisation of the importance of giving expression to my inner self. A: Growing older happens daily. It is not in a moment but through a life time. Valuing of even the small things gives meaning to the more awesomeness of our individual lives. It is also honoring the range of feelings in being. Q: …. How do you keep the spirit alive? A: I think the spirit comes through being creative, having joy in self, finding the surprise in each day. It comes from being inwardly aware and accessing oneself in many compassionate and depthful ways. Q: I’m drawn to the question of grief since I write about this topic and work in bereavement. Grief has been a huge teacher to me. …. Your line “Grief tends to press on the soul” drew me. Grieving for others took me on an initiatory journey that opened heart and soul and led me to a new life. …. How do you suggest dealing with grieving for our own vital selves? A: Not easy to grieve at all and for oneself is part of life, I would think. The decline may also open the inner world as the outer communication is changing. No doubt there are some tangible things but there are also your dreams, anything creative that helps expression and being with those who care and know how to express love in the many ways love shows up.The issue is love of self as well. A: … What we may have taken for granted … eg reasonable health, when it is taken away from us through no fault of our own, as in deafness, is a bitter pill. … When it comes to our own selves, I guess this kind of grief takes on a different flavour, goes to another level – I’m reminded of a quote by George Eliot: She was no longer wrestling with grief, but could sit down with it as a lasting companion and make it a sharer in her thoughts. Q: What can we do when we’re young, to grow old gracefully? A: …..There’s always grace in the world if we see it, in our own actions, thoughts and expressions. … Moments of grace are always around if we are open to it and take it in. At any stage of our lives – the planting of seeds leads to future growth. Well, I’m well over 1000 words already so I’ll end now. There’re so many more … maybe I’ll do another post soon with more of these interesting and depthful questions.. Thank you for reading. The seasons are changing, so is everything. Keep centred. Firstly, I’m really sorry that I had to abandon my previous post “What is Your Soul Asking of You” – I took it down a few hours after it went up. It is still too private for me to give you an explanation. I wish I could, but I can’t. I’m really sorry if you hit a dead link. Susan Schwartz and I are answering written questions on ‘Aging & Becoming’ via this link – https:redd.it/5u8b13. If you would like, during the course of today and this evening to pose a written question to this link, Susan & I will answer it. We go ‘live’ at 9.00 p.m. South Africa time, and 2 pm ET which means that we will answer written questions in a written form as and when and if they come up. But the link is open now if you would like to pose a question to us. We have a few hours yet in which to answer. I would so appreciate this. It is not a promotion of the book, merely to ask a question if you would like to. I was scrolling though the photographs I have on my cell phone to find one I liked. This above one was of the sunrise in Plettenberg Bay in July last year. Anita’s words (she emailed me the photo and brief): ‘A close-up picture is of the bark of a lovely quiver tree just before sunset, when the light is at its most photogenic. Taken at the Quiver Tree Forest close to Keetmanshoop, Namibia’. Janet Leifeldt who was in our group sent me this photograph at my request that she took of the black swan with a telephoto lens. The black swan in my cell phone photo is barely discernible – it’s right in the middle. But apt enough; some things are almost impossible to see. *I excerpted this from Wikipedia. In this particular article mention is also made of the necessity of being robust enough to withstand the fall out. Click HERE to see the book on Amazon. and to see the back cover which gives some more information. Thank you for reading. And thank you to Anita and Janet for the use of their photographs. The lotus arises from the mud, it’s habitat until it begins to rise and bloom in all its beauty and grandeur. More than ever we need to be steadfast and firm in the winds that are blowing. We stopped over for two nights at the Mountain Zebra National Park in the Karoo to break our return home from our summer holiday in Plettenberg Bay. It’s a place of great green beauty, mountains and plains – breathtakingly peaceful. One morning, after we’d been on a game drive, we set off to hike/walk on one of the shorter trails. I was in front of my husband who after 10 minutes or so, called me to say ‘look at this!’ I walked back and there as plain as day was a snake skin. Interesting to say the least – I’d never seen one, though it gave me a bit of a start to realise there could be snakes about. As we continued walking, I was thinking about the shedding of skin and how this is necessary in our everyday lives to shed skins or old attitudes when they no longer fit. Not more than 5 minutes on, I stopped short. The picture is not clear in among the shade but it is right in the centre. If I hadn’t been watching my path a little more closely, I may have stepped on it. I thought of the marches across the US and worldwide on Saturday and the steadfastness of women protesting against what needs protesting, walking peacefully, in solidarity, in the line of fire. I hope this photo doesn’t appear upside down on this post, but the book is available as a paperback on e.g. amazon.com & amazon.uk. This is the first public ‘announcement’ I’m making about it. When I’ve sussed how to do links I’ll post them. As human beings, not only do we seek resolution, but we also feel that we deserve resolution. However, not only do we not deserve resolution, we suffer from resolution. We don’t deserve resolution; we deserve something better than that. We deserve our birthright, which is the middle way, an open state of mind that can relax with paradox and ambiguity. I haven’t put up a post for a long while now. I wondered a bit about this – part of me wanted to be more engaged but another part of me wondered if I had anything of any importance to say? This morning dawned with rain and coolth and it has been like this the whole day. There is something so soft and cooling about this kind of weather. It did preclude though, my husband and I swimming across the lagoon, onto the beach, and walking across and having a swim in the sea on Lookout Beach this morning. I had my first swim yesterday – a bit unbelievable since we’ve been here in Plettenberg Bay since just before Christmas. It was wonderful being in the sea, diving into waves, getting knocked and bucketed about and dumped, being aware of the strong current pulling in the opposite direction. It was not the place to float as I would have liked to have done, but this will still happen. I was with my husband and brother – for my brother, his first swim in the sea also. We’ve had many walks here and there … the one day we braved the wind and walked on Keurbooms beach. My husband, brother and 2 sons .. The holiday makers have left, the town is a lot quieter. My sister who is currently at their holiday home in the Wilderness, about 1 hr 15 mins away from Plettenberg Bay, told me the story of her rescuing a cormorant tangled in fishing line on the rocks just the other day. She and her friend took the injured bird to the vet some way away, and when they got home they were phoned that the disentanglement was complete and that the bird was ready for fetching to be released. Which my sister did and carrying the distressed bird in a cage, returned to the scene with her son in tow and her grandchild aged 4. It sounded an extraordinary story as she related it to me, steep rocks to clamber over, her son carrying the small child on his shoulders, both of them barefoot – and before this story gets too long, the below photo is of the bird returned to the sea. Well done Sis, a great achievement. And then on their return to clamber up the rocks again young Matthew the 4 year old shouted, A fossil a fossil! Come quickly! Under the cave – this is her photo. Well, believe it or not, it is a log! This is a photo of the green drink I make most mornings – apple, spinach and water is its base – I add whatever to it, fresh ginger, cucumber, mint, a desert spoon or so of already prepared crushed seeds, including sunflower, sesame, chia, coconut flakes and other … (made by me, stored in airtight container) ..
Back to full moon and spring tides … I doubt we’ll see it tonight, it’s too cloudy. The waves that I can see from my balcony don’t look overly large, in fact the lagoon and the sea looks positively calm. Maybe it’ll change tomorrow. On that note of change, may I wish you calm and peace as this year gets underway. Solstice (from the Latin, sol:sun; sistere:to stand still), a twice a year happening when the earth stands still for a nano-second and then begins its tilt in the opposite direction towards a new season. In the northern hemisphere where the night is the longest, there is a promise of warmth to come after the bitterness of cold. In the southern hemisphere and the longest day, we’re aware that the days will shorten and the nights will be imperceptibly longer. For many if not all of us, 2016 has been a particularly tumultuous year. Maybe we say this each year as it draws to a close and we look back to all that has happened not only within our own lives but at events around the world. I hardly need to mention them. Have we reached a tipping point? Are we tipping over? May the December winter and summer solstice’s stillness be the precursor to the turning point for our world as we approach the new year. More than anything we need peace, compassion and goodwill on our planet. The deeply felt knots that keep us bound need untying. We’re down in Plettenberg Bay for the festive season. Both our sons are here, Davey with Jüte his bride. My husband’s sister Jenny and her husband from San Francisco will be with us on Friday, en route from visiting friends in France. I’m preparing for this great celebration. I brought down from Johannesburg a poinsettia plant which was a gift. There’s something so Christmassy about them. Lastly, our Christmas card greetings to you. My son crafted it some years ago and we just update the year. This time we’ve obviously included Jüte, our beautiful daughter-in-law, a blessing in our lives. It comes to you with love. Thank you all for your warmth and friendship. Long may it continue. I took this photo on Tuesday late at night after a rain storm. I felt the wet grass beneath my bare feet, looked up at the obscured moon and stars sometimes glimpsed among the densely clouded sky and was struck how the little solar lamp formed a lighted circle on the ground around the plants. I thought about the week still ahead, closing down the rooms, seeing a few friends locally before the upcoming travel down to Plettenberg Bay where we will be a full house over the festive season. I thought about the politics here in South Africa and abroad, the devastation in Aleppo, Mother Nature and the ongoing attempts of her destruction. The troubling person who is the US president-elect. And wondered about the psychic infection of warring and the inherent dangers of such an infection. To me it seems as if there is an upsurging of another kind of power, one that is life-affirming, curious, intriguing, loving. It appears in dreams, where women dream of other women who offer succour, listening, arms opening to embrace the other. Where women enfold and embrace all that is and have a knowing that even among all that is dark and disturbing, there is a way towards greater wholeness and harmony. ‘Out beyond ideas of wrongdoing and rightdoing there is a field. the world is too full to talk about’. “I live my life in widening circles that reach out across the world. I may not complete this last one but I give myself to it. I circle around God, around the primordial tower. I’ve wrapped presents for the girls at the rooms – we have our Christmas lunch next week Thursday at a fancy restaurant. The rooms will close down that day after my husband has attended to his patients in the morning. The next day, 16th December, is a public holiday, the Day of Reconciliation* in South Africa held annually on16 December since the end of apartheid in 1994. Reconcile – a pretty powerful word. From The Shorter Oxford English Dictionary On Historical Principles Vol 2:- Reconcile 1.1. trans. To bring (a person) again into friendly relations to or with (oneself or another) after an estrangement. There was much else also, under Reconciliation and Reconciliatory – quite easy for me to get diverted and indulge in origins and historical quotations of it and what it meant from times past. And to wonder about reconciliation in the current times in which we are living. Not just here in South Africa, but world-wide. I especially like that the definition includes ‘…friendly relations ... with (oneself …) after an estrangement. My husband & I spent 5 days down in Plettenberg Bay recently. We thought we’d get a tiny bit organised before we go there for the festive season around the 19th or so. Well, we did a bit, the pantry has some tins of tuna, three bean salad and beetroot salad and some things in the freezer. My husband found this butterfly wing in our driveway at our Plett home. I still have it in a notebook somewhere. I love this image – it comes from The Spectator, many copies of which I have offloaded from my friend Lyndy. The image is used for Diary. Various columnists contribute to it. 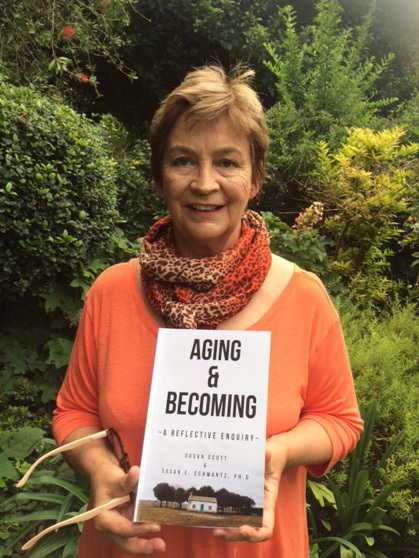 *our book: ‘Aging & Becoming ~ A Reflective Enquiry’ in process. Soon to be published I hope. the step you don’t want to take. I had not planned it but this morning saw me tidying, organising my bathroom cupboards, taking stuff out of bedroom to my study (still to be sorted), colouring my hair, a facial scrub and baobab oil on my face right now as I go about tasks. My American friend who lives in Cape Town phoned this morning – she is arriving tomorrow in Johannesburg to see her eye surgeon and will overnight here at my home. She recently returned from the US after attending the funeral of her older sister. She is in deep pain at the outcome of POTUS. She is politically savvy and right now, aghast and fearful of today’s news of the election of Trump’s Chief of Staff. Plus Trump repealing the 2009 interdict (though I think it was never interdicted?) which kept bank and private money separated after the ‘lesson’ of the crash of 2008..
We are very aware of the heart-felt pain of Americans who are exceedingly alarmed at the election of Donald Trump. I have several friends in the States both personal and through the Internet whose views I deeply respect and I can feel their deep concern. The reverberations are huge. Everywhere and every one in the world has reason to be exceedingly alarmed. The thought of nationalism on the rise is extremely worrying. So many, many concerns …. As I was going about my tasks this morning I found myself thinking about these extraordinary times in which we are living. I’ve read much on social media, some very excellent posts on FB for example, clear analyses facing the dangers, thoughtful blog posts, quotes by the Dalai Lama, Buddha and so on reminding us of the inner light. I follow a few Jungian FB threads which are always interesting. A man who lives in Sweden for example recently had a dream where the underground systems of Stockholm were crumbling and out of the morass exited a woman dressed in white charging away from the mess. He wondered what it meant. It’s a powerful dream in my view. Many FB posts write of their shock and hurt and deep deep pain. Susan and I write in our book about the moon in a chapter called ‘Moon, Mourning & Mystery’. What force other than the moon who pulls the oceans from shore to shore. The moon has a direct effect on women’s monthly bleeding when a group is in synch. Plantings are done by the moon – and much more. Mourning – such a time right now. Mystery – will we ever know – what is next? The full moon is tonight – may we pay attention to this occasion at this time. Her energies are feminine ones. We can call on her. We can look up at her beauty tonight. We can look up at her while looking deep down into our hearts, and send a message or a prayer or an invocation to her that we need her healing energies. We know that she is a guide – she has guided ancient travellers for aeons as have the stars .. I will consciously ask her for peace and patience, calm and still, to be a balm to all in this time of upheaval. I will ask her to bear with us in our pain and woundedness at least for a while. I will ask her for her feminine energies to shine brightly on the masculine energies so that unification can happen. I will ask that she shine benignly on our planet in crisis on so many levels. Simone Weil: ‘Attention is the rarest and purest form of generosity’. Photo taken at 6.15 this evening after major afternoon rainstorm. ..
Why do I get excited? Well, it is a symbol of much. The praying mantis was believed by the African Bushmen to be a symbol of God. They believed it was a manifestation of God, and when they saw one, they tried to discern its message. The word ‘mantis’ is a Greek word meaning ‘prophet’ and is a reference to mystical or spiritual powers. The mantis comes to us when we need peace, quiet and calm in our lives. Usually the mantis makes an appearance when our lives and the world seem chaotic, so much so we can no longer hear the still, small voice within us because of the outer noise that surrounds us. We’ve been living on a knife’s edge here in South Africa. We expected our Finance Minister Mr. Pravin Gordhan along with two colleagues to appear in the High Court tomorrow on fraud charges. There were plans to get myself and a few friends off to Pretoria tomorrow to take part in the protests. The support for the Minister is very strong from all quarters, the public, government ministers, business, civil society – Min. Gordhan has commandeered us through some very tricky waters. The head of the National Prosecuting Authority, Adv. Shaun Abrahams has been after Mr Gordhan for a long while. Yesterday, at a press conference, Abrahams dropped charges against Mr Gordhan and his two co-accused and Abrahams has egg on his face. Now there are calls for Abrahams to fall on his sword, and he and his pathetic minions to disappear off the face of the earth. We’re awaiting the release of the Public Protector’s report in which it is purported that our president has allowed our government to be captured by the Gupta Family (like the mafiosa), for nefarious reasons. There is every reason to believe so. Nuclear deal with the Russians for several billion rands, dollars, whatever currency? When we have the best wind and solar resources? And not that much money to spend on yet more state deals when for example our national air carrier is running into a few billion rands debt for the last few years running. Pres. Zuma and his cohorts are doing their best to not have it released. We’re undergoing our own Watergate – there are calls to have the president impeached. I once had one on my desk. I’ve seen one once or twice on a plant just outside my study. I once saw one on the wall behind me when I was lounging outside on the deck at a game lodge.Their appearances are rare. When I see a lady bird, I also feel something within. A reminder of the beauty of nature and to bring that stilness within amidst the turmoil of the world. It rained a bit last evening. And now as I write, it is raining. It is so much needed. It has cooled things down by a degree or two. We need the skies to fall and to cleanse this land we call home, to wash away the dust and grime that clings to us in so many ways. The praying mantis gives me hope. From outer space, or lost Atlantis? And faintly whisper, Lord deliver us. If you would like to receive posts automatically, please enter your email address below. Thank you.